Today we are making Halwa from fruits as like apple, banana, strawberry, etc .One day my son want to eat a new type of high nutritional value food. He told me , ”Aai make Halwa” Then I thought, how could be I make high nutritional value Halwa without fruits. 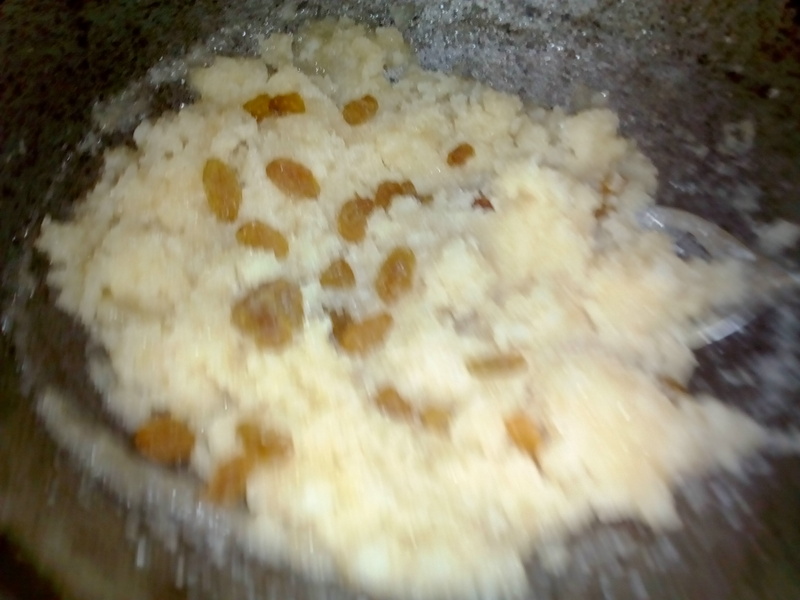 sThen I thought let us try to make Halwa from cream of milk & see how did it will make? PROCEDURE : Take the Rava in the pan & start to bake with ghee . : Bake it still pink color appears . : Now add cream milk, almond powder, cashew nut powder & cardamom powder. : Now add hot water to it . Stir it well . Keep lid on it . : Spread some raisins on it. Next Post Chikoo Milk Shake ,Fasting [Vrut]Recipe, Navratri Special – Milk Shake Recipe. Really , on that it was become very delicious.